The Hammond Theatre020 8783 4421work TheatreThe theatre seats 380 people and is fully equipped with state-of-the-art lighting and sound. It offers the perfect environment for a wide range of performances and attracts professional companies from around the UK. Recent productions include children’s shows from The Theatre of Widdershins puppeteers, The Reduced Shakespeare Company, comedy nights and a variety of classical concerts. 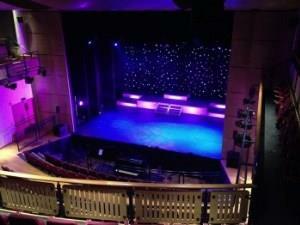 The theatre seats 380 people and is fully equipped with state-of-the-art lighting and sound. It offers the perfect environment for a wide range of performances and attracts professional companies from around the UK. Recent productions include children’s shows from The Theatre of Widdershins puppeteers, The Reduced Shakespeare Company, comedy nights and a variety of classical concerts. The Hammond Theatre is an accredited venue for National Theatre Live screenings which allow audiences to enjoy the very best of British theatre ‘live’ from the London stage in the comfort of their local venue. The Theatre is situated in the grounds of Hampton School. Access is via the main gate of Hampton School. Please note: There are three schools on Hanworth Road – Hampton School is between Hampton Academy and The Lady Eleanor Holles School. By car: Easily accessible from the M3 and the A316. If travelling from west or via the M25, join the M3. After junction 1 the M3 then becomes the A316 – leave at the first or third junction (A312). From the south and south east use Hampton Court Bridge. From the east come through Kingston, Teddington or Twickenham. From the north east come via Richmond and the A316. Free parking for up to 100 cars. By bus: easily accessible from Kingston, Hounslow and Twickenham via the bus services. The 111 (24h) stops right outside. The R70 stops near to the Theatre. The 216 stops at Hampton Station and the nearest R68 stop is ten minutes away. By train: Hampton (London) railway station is a 20 minute walk away. Hampton station is on the Waterloo-Shepperton line, in Travelcard Zone 6. The station and all trains serving it are operated by South West Trains.